Squirrel Confectionery are a UK company owned by Tangerine Confectionery and they make popular products that include Cherry Lips and Floral Gums. Monmore Confectionery stock a range of their wholesale sweets that can be bought by the public or they will make a sweet choice if you want to stock these tasty sweets in your shop. 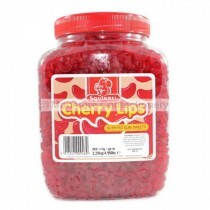 Squirrel Confectionery offer their popular products like their Cherry Lips which are an iconic product that are enjoyed by both kids and adults alike as they are a fun product as well as tasty. They also have floral gums which are a selection of different favours gums that make ideal pick n mix sweets. Monmore Confectionery offer these products at affordable prices. Squirrel Confectionery was acquired by Tangerine LTD with their popular gummy sweets proving to be a big hit with sweet lovers. Monmore Confectionery have what you are looking for when it comes to Squirrels products.